This is a similar set of ingredients to an earlier post of mine (“pasta with spinach, ricotta and mint”) but with some key differences. 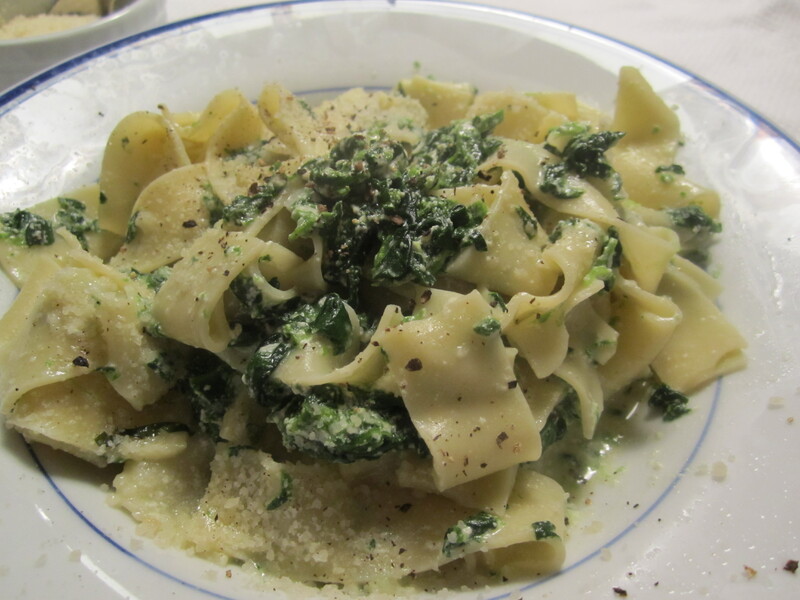 This is a butter-based sauce used to dress fresh egg pasta, with spinach chopped finely and incoporated into the sauce. The prior post was spinach sauteed in garlic and olive oil, over dried pasta, topped with a dollop of ricotta laced with mint. This is a very luxurious-tasting pasta due to the fresh egg pasta and the butter in the sauce. The sauce is basically my mother’s filling for lasagna, but when lasagna is too much of a production, and you want that same rich cheesiness, try this dish. Although I used fresh spinach–blanched, shocked squeezed and chopped–you can use frozen–thawed and squeezed dry. While the pasta is boiling (egg pasta cooks quickly) combine the butter, spinach, grated cheese, ricotta, nutmeg and mint in a skillet large enough to hold the pasta and warm on low heat. Toss in the cooked pasta, some pasta cooking water and serve with more grated cheese at the table. The spinach can be cooked and squeezed in advance, the entire sauce assembled, then heated with butter and served at the last minute. While pasta is boiling in salted water, combine the remaining ingredients in a skillet broad enough to hold the pasta, on low heat. Bring to simmer and add the cooked pasta, along with some cooking liquid. Toss and serve in heated bowls with additional grated cheese.